Here is a proper update to my main rig's build log. I didn't start with any 3D models or sketches or anything like that, this mod is being done completely on the fly so aside from what I've already done. It's completely open to suggestions. I've decided to do both picture and video logs for the build. I'm using my Samsung Focus for both so that will be my excuse for the really crappy sound quality in the videos. There are a ton of photos to go through so they might not be up right away but you can see the next post for the video log. So I spent the last 6 hours doing a little painting and man what a difference it makes. I used "Milano Red" car body spray paint from Canadian Tire and sprayed a bunch of coats directly on the pieces after roughing up the surfaces with a little sand paper. Life. Liberty. The pursuit of those who oppose it. "YOUTUBE: revealing all﻿ the stupid people on earth...one video at a time." Nice man! It looks amazing! I also have a CM 690 II Adv, and I wanted to paint it, but I had no idea where to start. Can you tell me what paints and primers you used? I am thinking about giving my case (same areas you painted) a piano white coat. This computer started off in an old In-Win Griffin Case that was Yellow and Black. Then I upgraded to this case but it was all the same hardware. Although now it only has 2 original parts left from the first build. 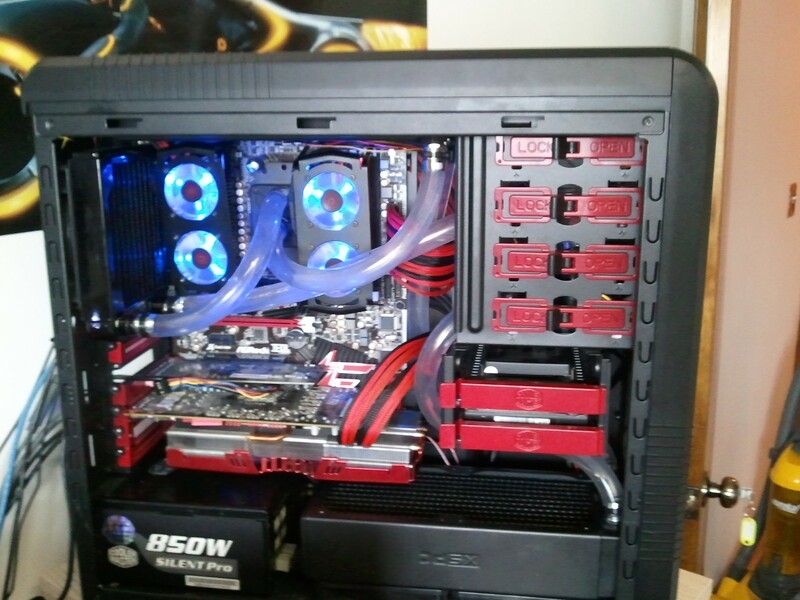 The four Scythe 110 CFM Slipstreams, and the 60 GB Vertex 2 as a boot drive. I just used some Premium Automotive spray Paint made by Dupli-Color that I picked up at a hardware store. I just grabbed some 600-grit sand paper and scuffed up the surfaces a little. Then I did about 5-7 very light coats of paint until the parts matched all matched. I didn't actually use any primer. Thanks I find it looks so much better than I thought it would.